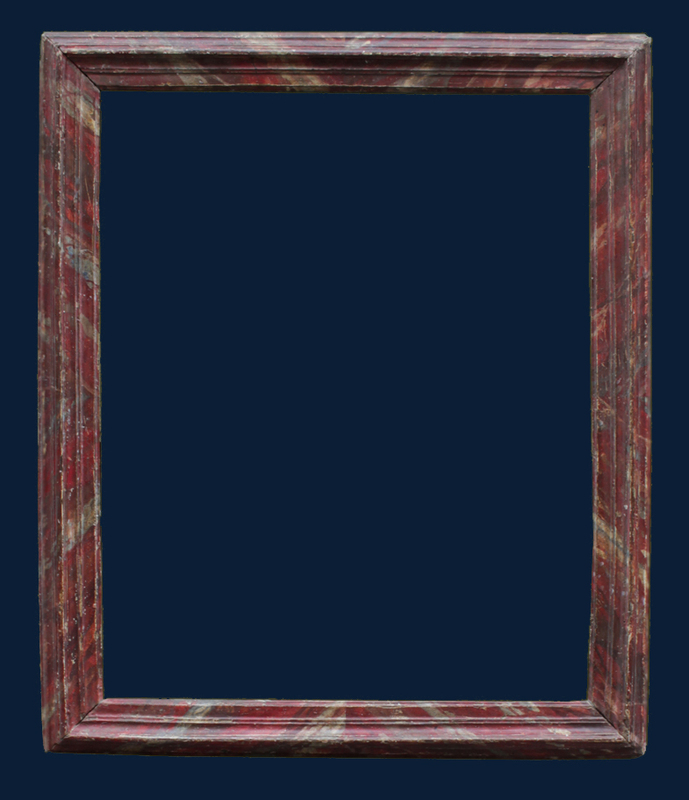 Unusual | Rollo Whately Ltd.
Over the years I have come across a number of painted frames. Prompted by three I recently bought in Italy, I photographed a group of them which can be found below. 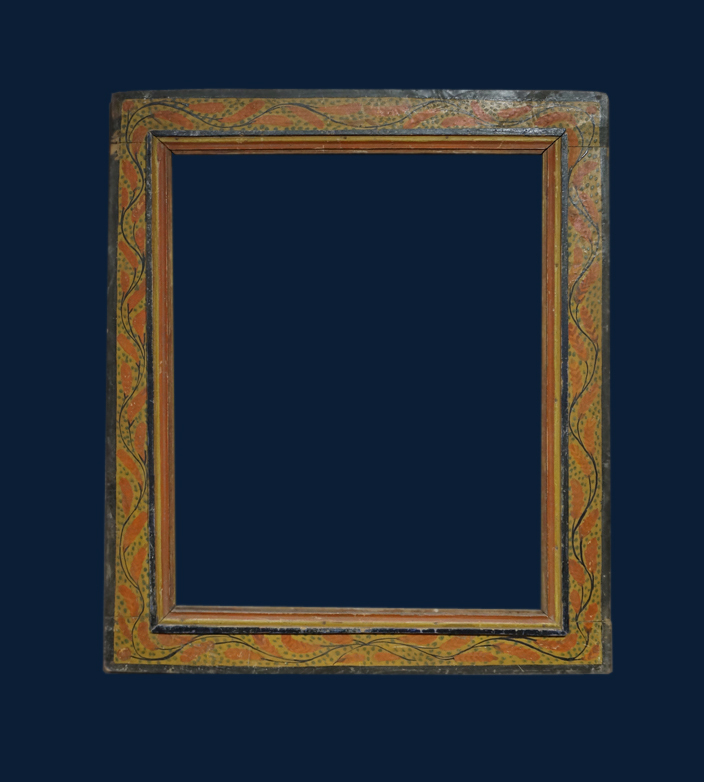 For a dealer/maker of frames, the painted frame represents a refreshing change from the usual – I guess this might also have been true of the people who made them … There is often a remarkable decorative skill in these frames: some may have been chosen because they offered a cheaper option to whoever was paying for them (ochre paint instead of gold leaf) but others really seem to be a labour of love – especially the one with the little sprite on it. Most are of a more or less cassetta section, the flat area allowing space for any decoration. 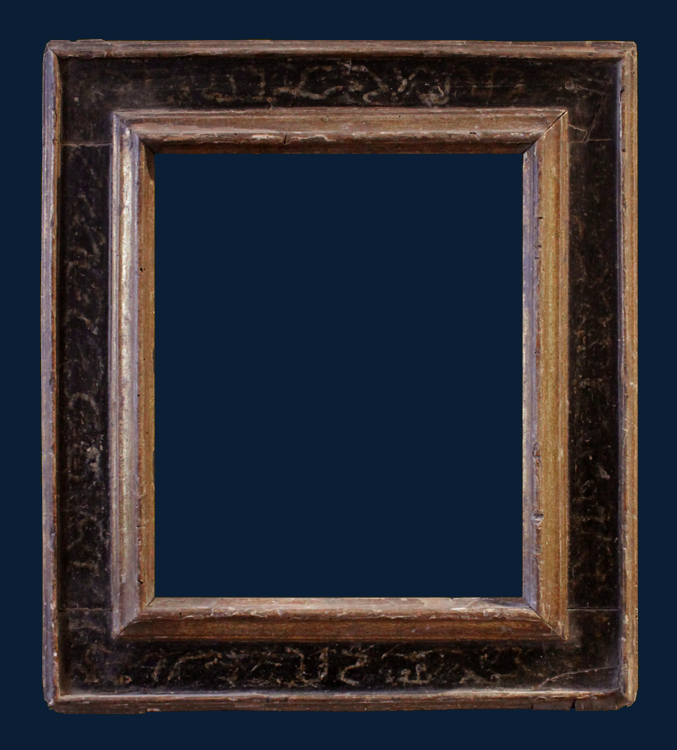 Many painted frames from Italy are automatically said to come from the Marche, an area on the Eastern side of the country. I am not sure if that is only where they come from of if they were made all over Italy – which is rather more likely. 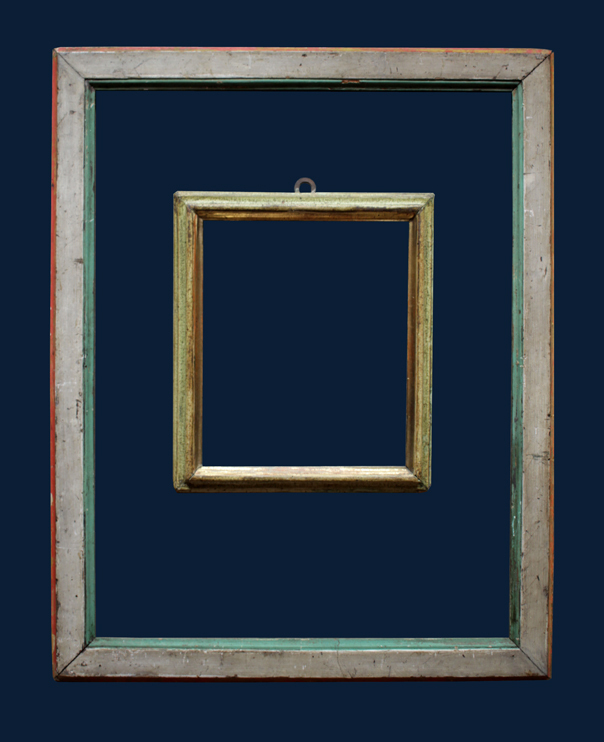 There is very little literature on Italian painted frames, at least that I know of and I would be delighted to hear from anyone who knows more than the little I do about them. Above, let’s start with one in the Italian colours – red white and green! 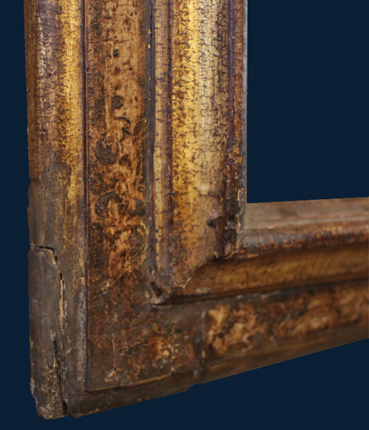 The smaller, inner frame is reverse section, gold and pale pistachio, with a lovely patina. and this one which, though cut down still is a good example of the decorative possibilities of marbled patterns, not least the use of blue, a colour otherwise not often associated with frames. 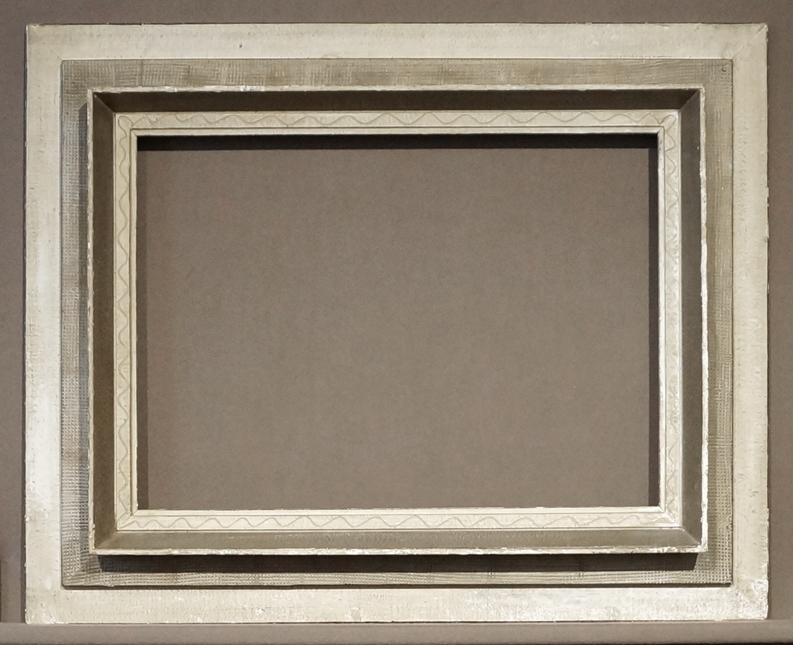 While these frames use marbleising as a decorative solution to the frieze in a cassetta, the frame below uses the technique to make a frame to imitate realistically the kind of marble surround that might be found in any number of Italian baroque churches. The marble being imitated is known as Rosso di Levanto. 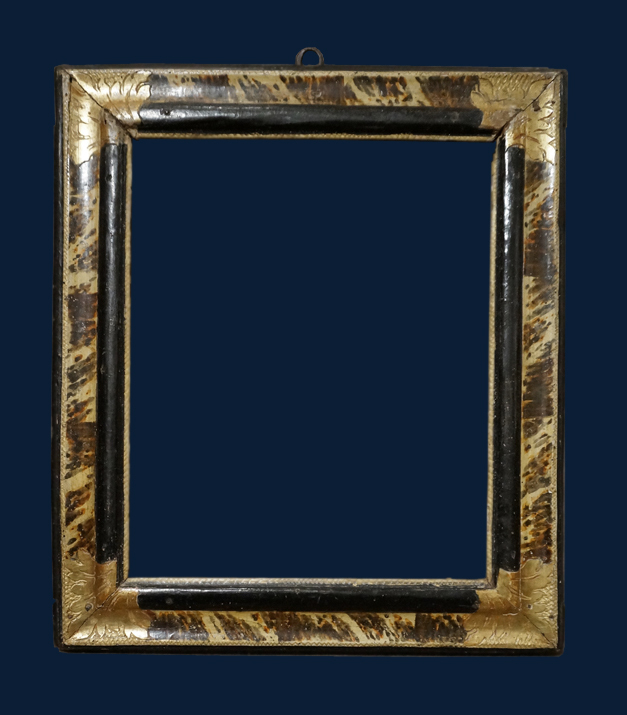 Tortoiseshell is another substance that was frequently mimicked in these types of frames, here with engraved, gilded corners on a hazzled background. 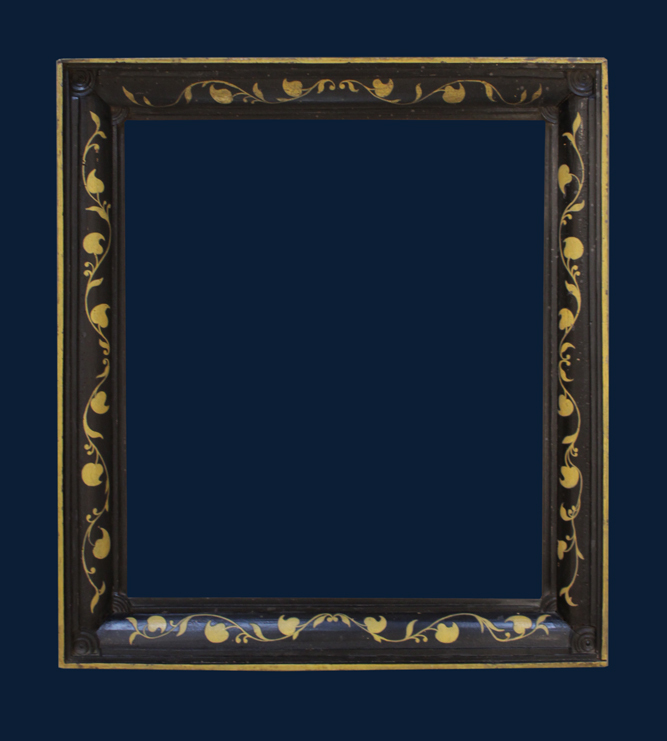 Just like the centering on the rosso di levanto frame above, the artifice on the tortoiseshell frame extends to making ‘breaks’ where, were it real tortoiseshell, the leaves of shell would be joined. 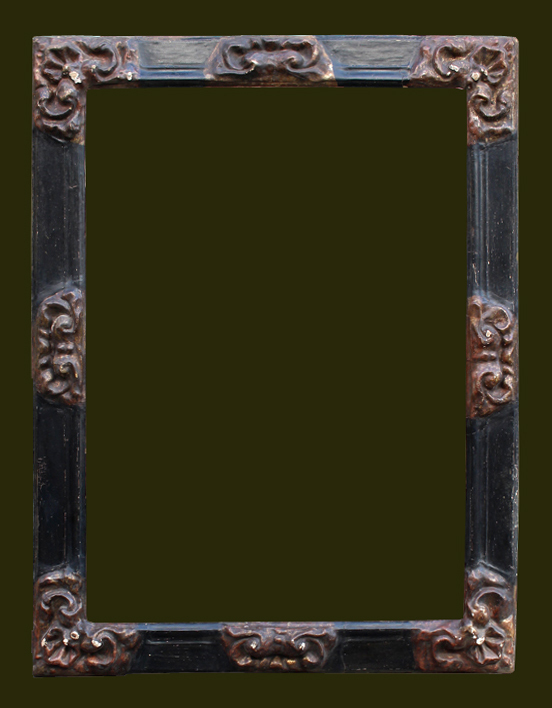 I am not the only person to have seen this and thought how ‘Bloomsbury’ it looked – the same could be said for this Spanish frame, and the detail I have taken of it. 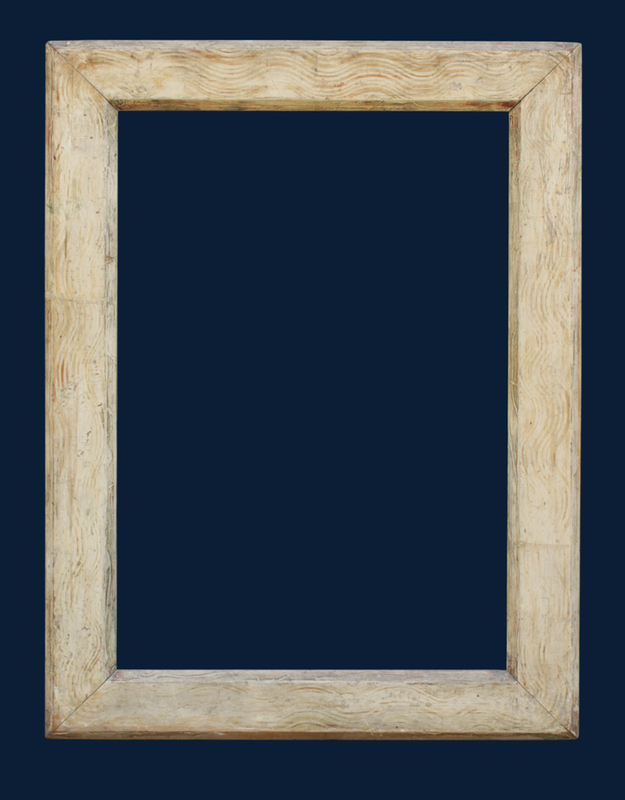 The possibility for creative detail on frames is shown to wonderful effect in this example, back in Italy now – note that the lacquered surface of this frame is similar to the black and white marble one above with a deep shine. 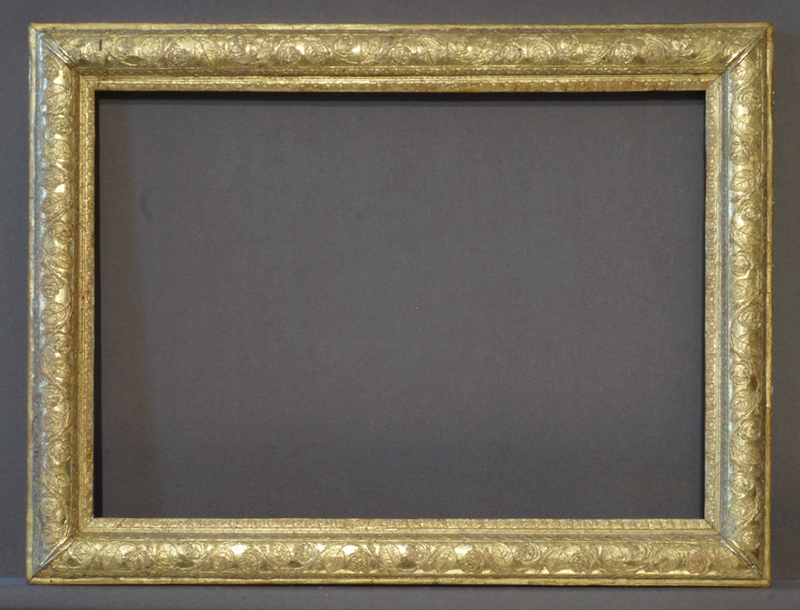 Also interesting about this frame is the gilded sight and back edges are actually lacquered silver. 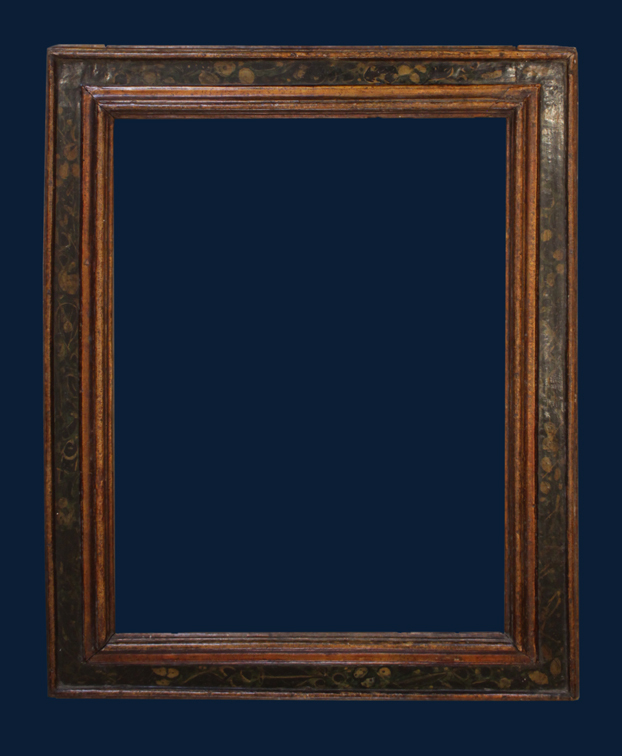 There is an apparent cut in one corner of the sight of the frame but I think this is just where the maker ran out of wood and put an extra piece in to get to the corner! The organic leafy/marbly pattern, in dark green has a rather William Morris on acid/Graham Sutherland feel – and, if I am not reading too much into it – there are some little sprite-like faces added by the framemaker. 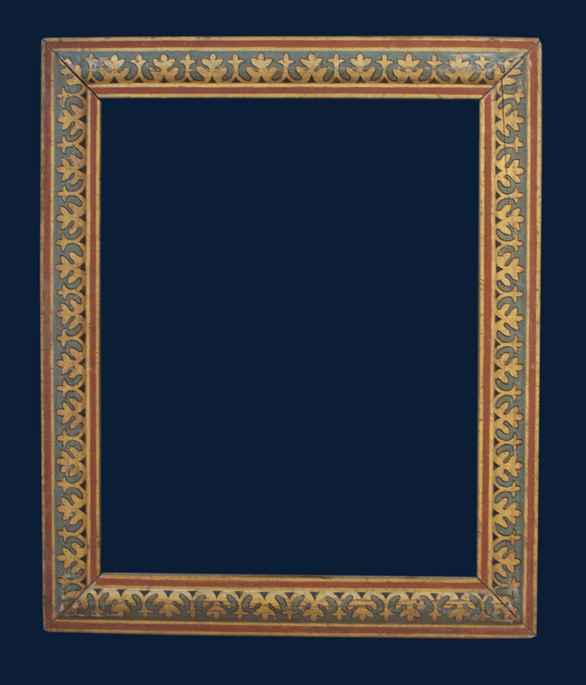 Another frame, same section, is this one – where a marble/fabric pattern has been overlaid on a more usual centre and corner ornament, which is just visible in the detail of the corner, below. 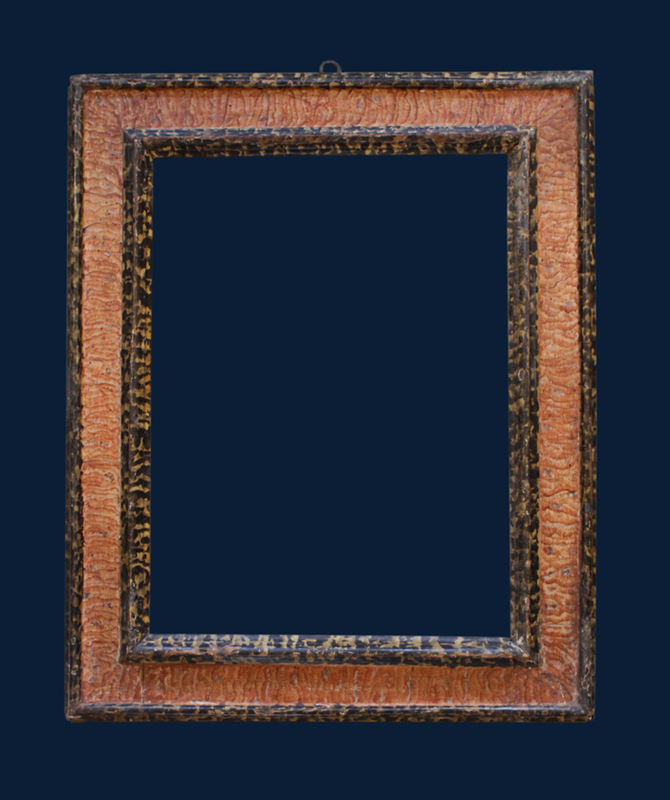 The frame has a wonderful ‘leathery’ colour and feel to the surface. 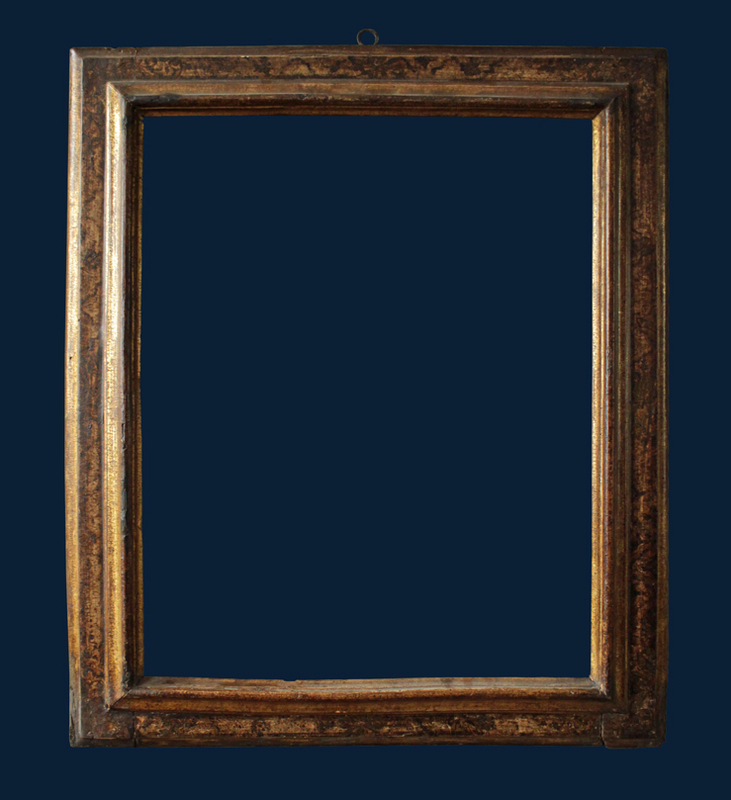 I haven’t included the many types of white painted frames from the late 19th Century Degas frames to the ‘mod Brit’ frames from the second half of the 20th Century. 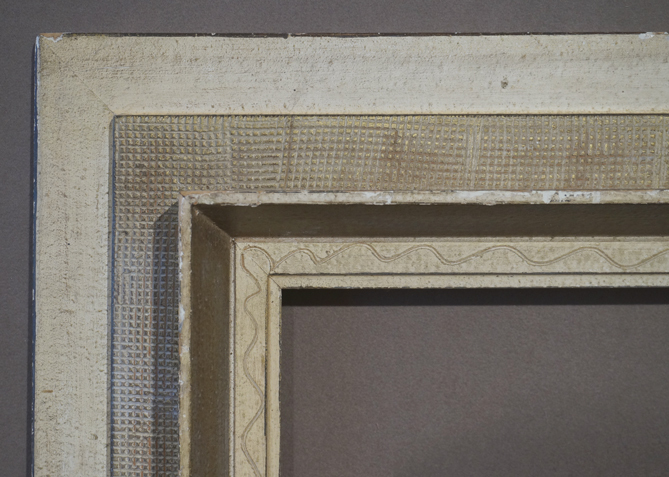 But this white painted frame seems to belong with the others – it may well be Italian, definintely 20C, poplar but keyed on the back – could be English perhaps? – it came from a picture framer in London. 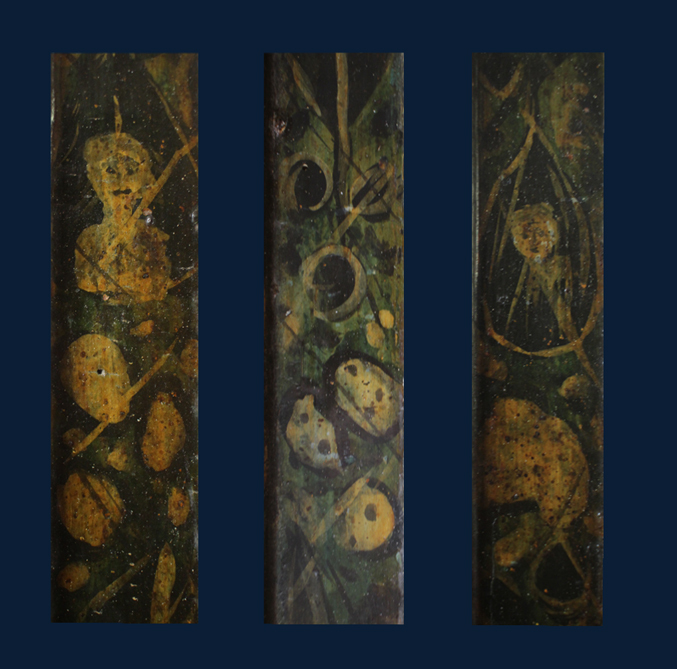 It has a very attractive art Nouveau swirling pattern painted in thin red and yellow clay (the type used underneath water gilding) direct onto polished gesso. I like the way the waves go around the corners and how the pattern is hardly there. 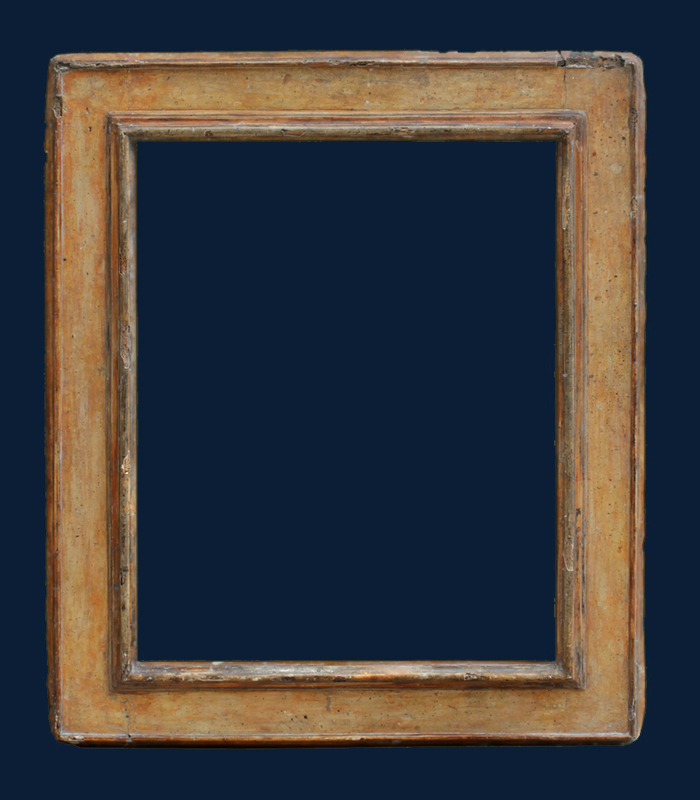 To end this group I have added a few 19th Century frames from France and Spain: these have a very different feel to the more organic and painterly frames from Italy. If you look carefully at this one you can see that the corners have what can only be draughts counters set into them! These last two frames, later 19C and French, are painted green/ eau di nil. 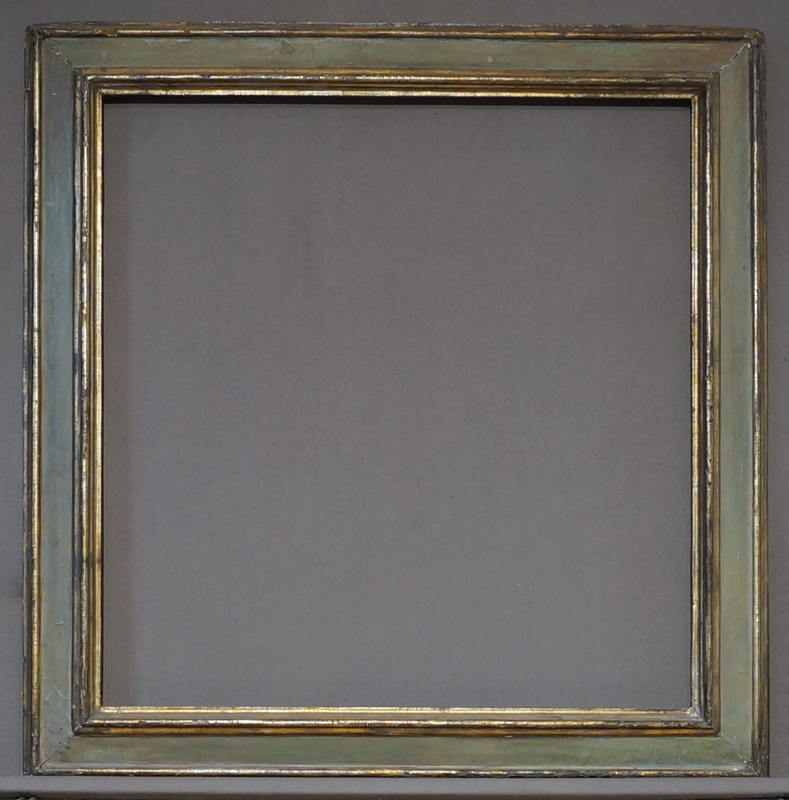 We have copied both of these frames quite successfully, the smaller boxy section frame made a much larger size but this same, rather medical, green colour. 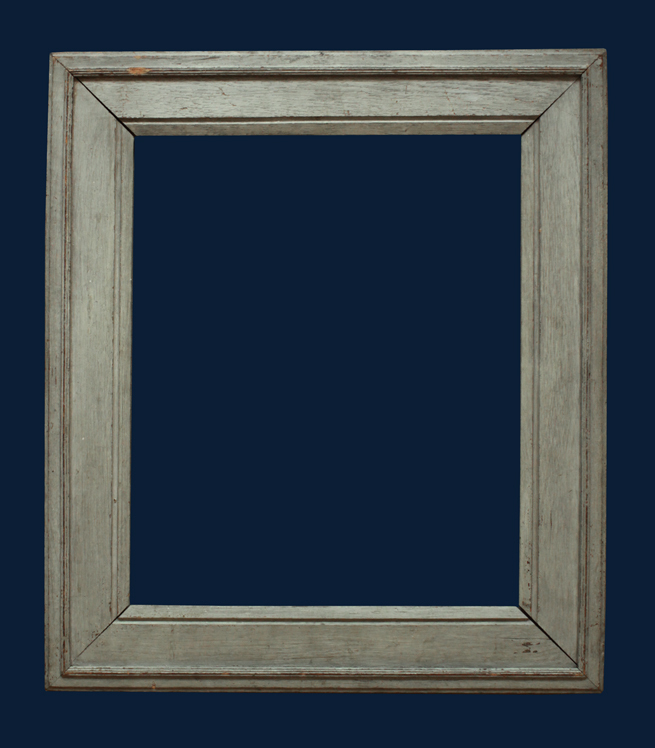 The frame below is also painted pale green, which works wonderfully on a a grainy oak frame. 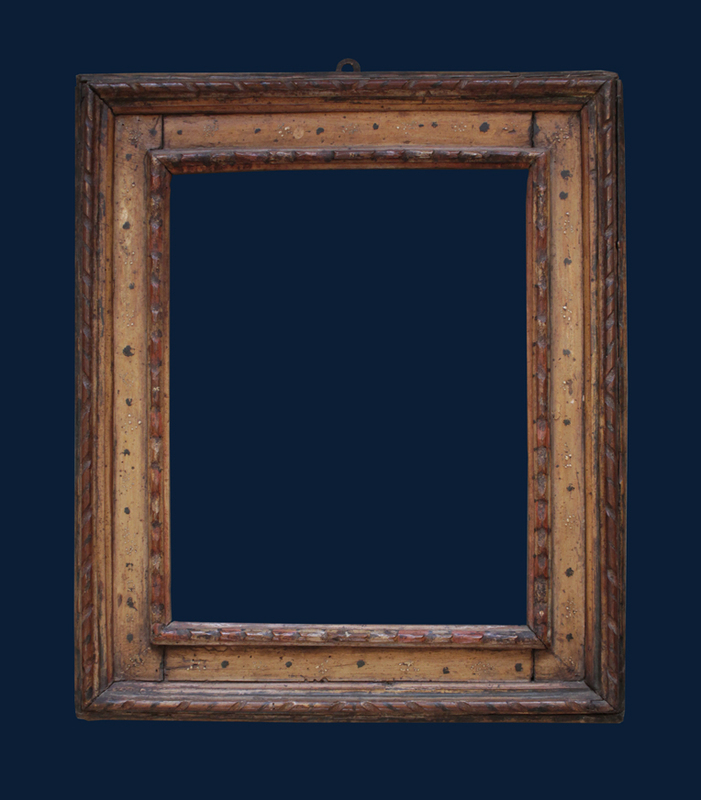 Known as ‘Tramp frames’ or ‘Black Forest frames’ or ‘Hobo frames’ these sorts of frames date from the late 19C to the first half of the 20C. A Wikipedia entry says that it was an ‘art movement found throughout the world’ but concentrates on those found in North America. Actually, they fairly frequently come up in sales in Paris, and David Lacy often has some in his London shop (both of these came from him). 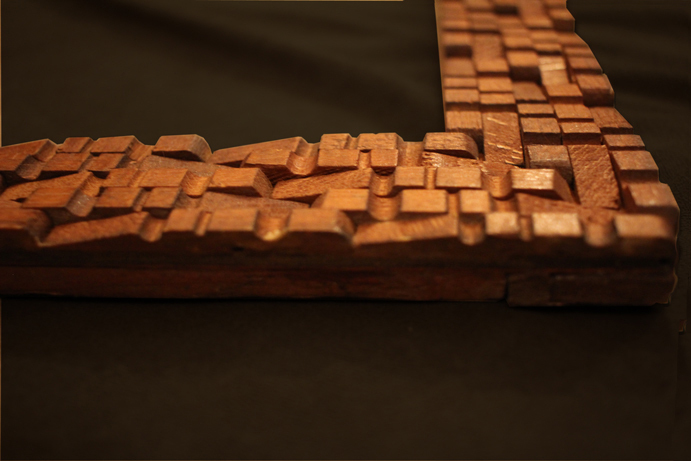 The frames are typically made up of layered thin slices of wood, often with the notches that you can see in the example above. 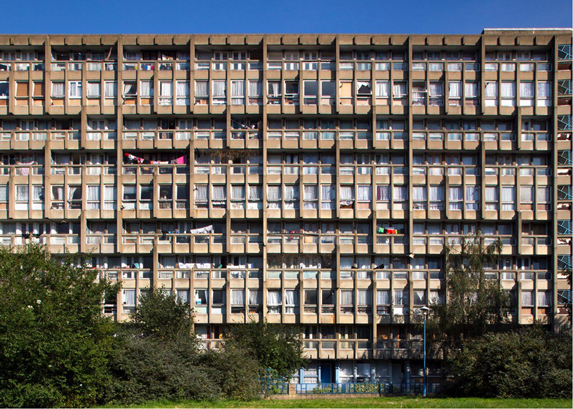 The theory is that they were made on long winter nights by simple folk/prisoners of war/tramps but, whoever made them, they can be very sophisticated. While many of these frames can be crude and rather folksy, sometimes they can also be really beautiful and have that balance thing going on that I like so much. They must have taken quite a while to make (those long winter nights again) but are often constructed with a confidence in the pattern that is disarming. And they are all different! 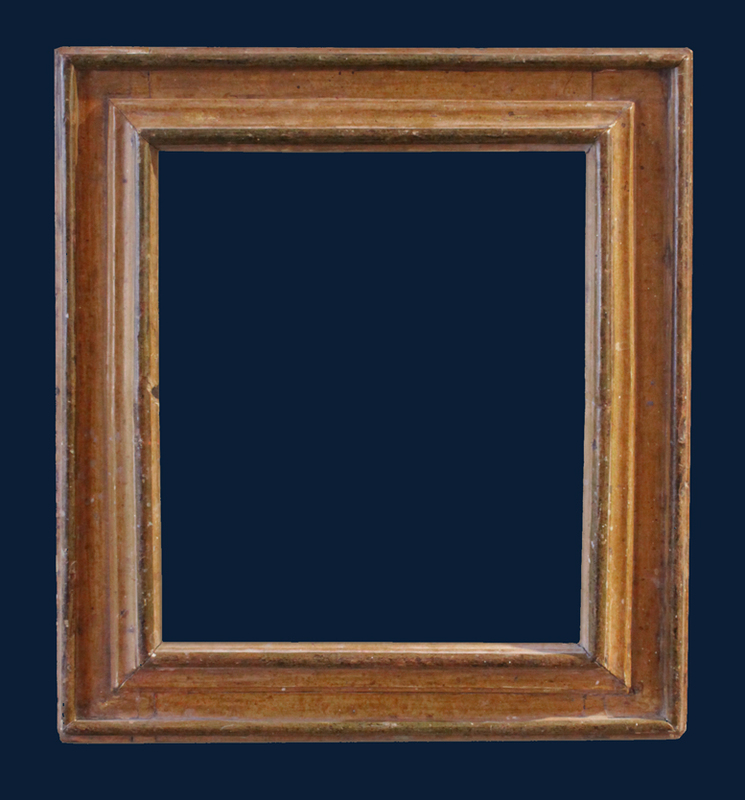 Many frame types are more or less generic — a French Louis XV pastel frame or an English Carlo or a Venetian pastiglia frame — but these, though they share the basics of this assembled construction and unfinished, or stained and part painted, surface, are all designed differently, as if that was part of the challenge, like God doing snowflakes. A frame I recently bought can also be thought of as a Tramp frame though it is not made up of the usual layers but, rather, of split ordinary wooden clothes pegs. To be honest, I didn’t realise this when I bought it, which I did just because its so good to look at. There were three half-pegs missing but I raided the laundry bag at home and, amazingly, they were almost exactly the same. This simple frame shows the impact of elegant design. It has a slightly cushioned back edge, barely visible in the photo above — and was probably a print frame (it has a double rebate, sometimes used to keep artwork away from the glass). It may have been one of many such made in a workshop in the 1860s, or 1900s — I don’t know — but whoever came up with it had a very good, pure, eye for design. 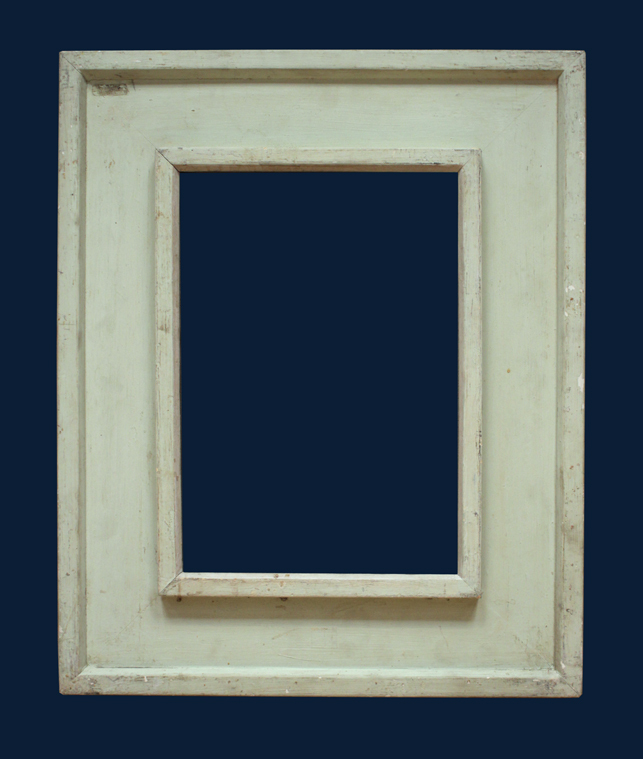 A very unusual Spanish frame with paper-moulded centres and corners. 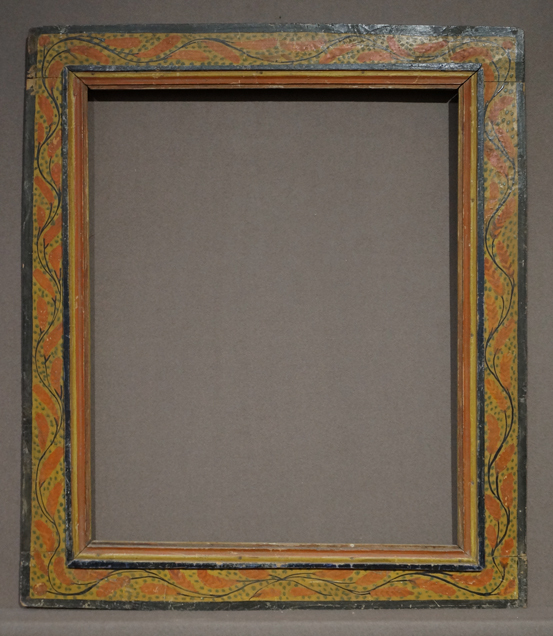 This is quite a large frame and the boldness of the ornament means that it needs a strong, possibly modern, painting to frame. 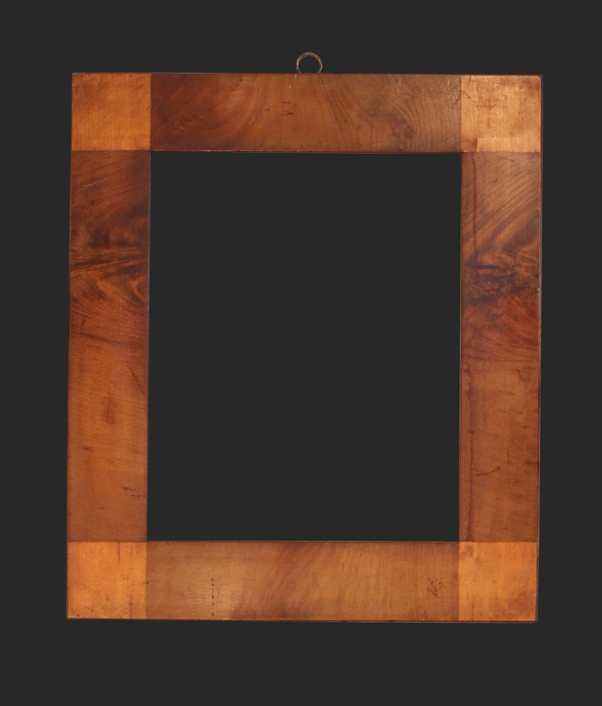 Interesting frame, I am not sure what the wood is but it is polished to show the fine overall grain. Might be in the Japanese style? It would make a marvellous mirror. 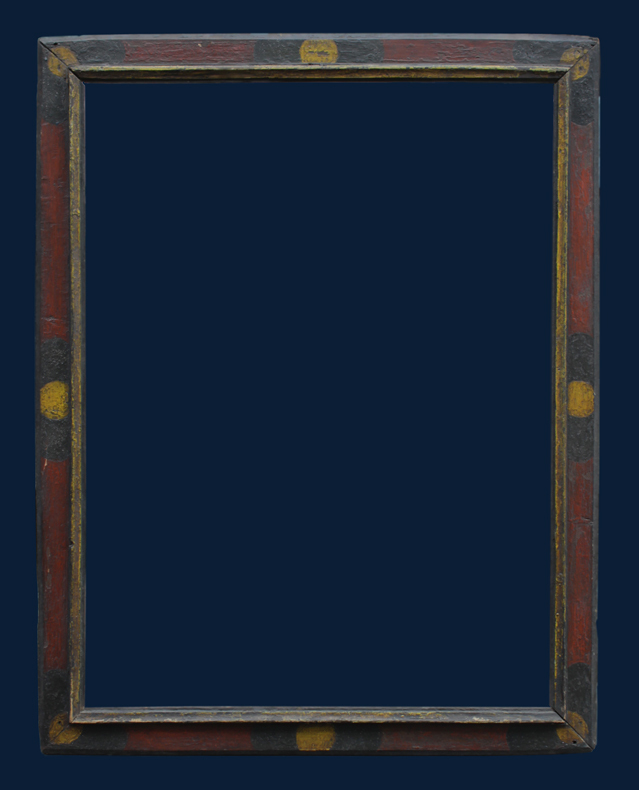 This is a very attractive painted frame. 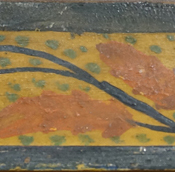 The painted wheat ear-like flowers and leaves remind me of Bloomsbury ornament. 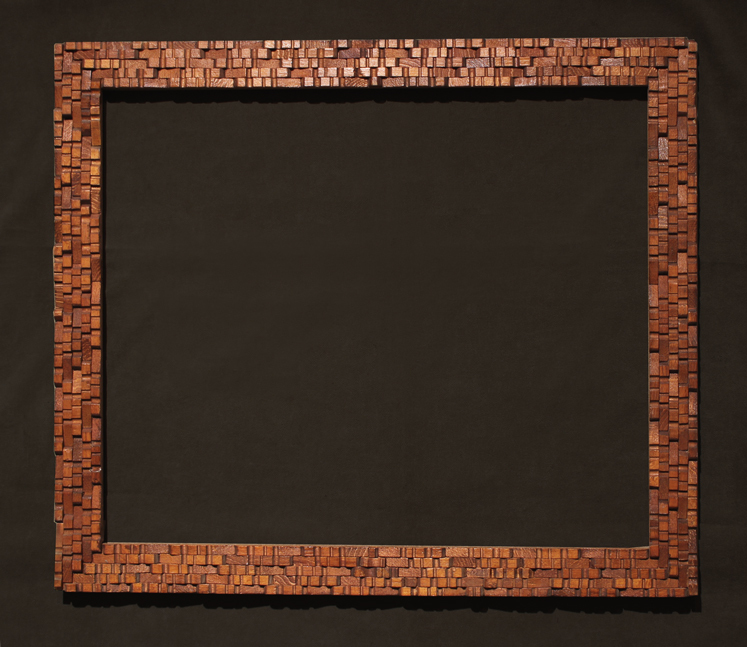 I also like how the sides of the frame taper slightly and are of different widths. 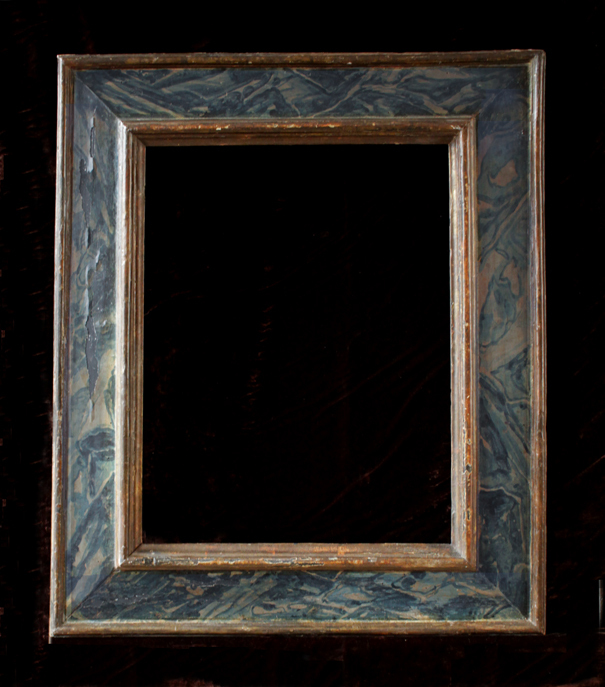 Frames covered in embossed paper are fairly unusual — this one is in very fine condition and great care has been taken with the gilding. 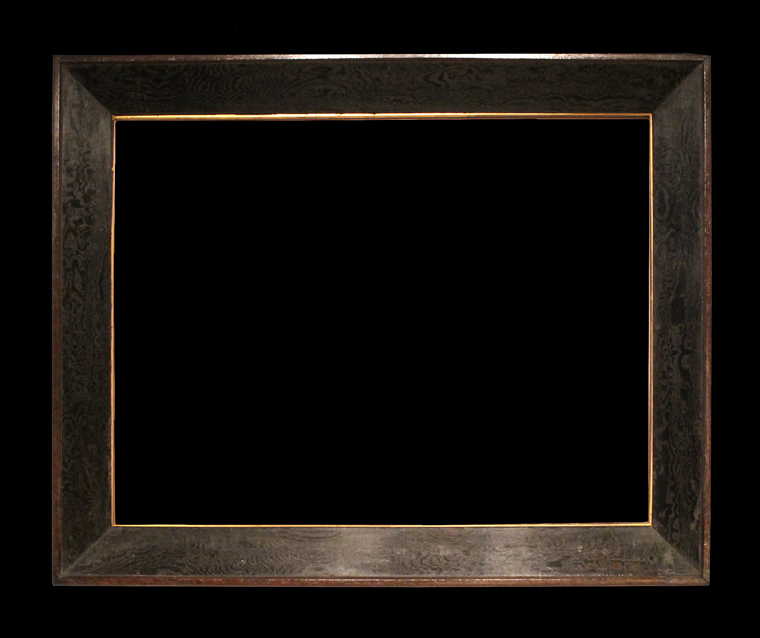 Modernist frames are often the creation of artists and frame-makers working in conjunction. They can also be quite wacky and inventive.